Symbolic power is discussed with reference to mathematics and formal languages. Two distinctions are crucial for establishing mechanical and formal perspectives: one between appearance and reality, and one between sense and reference. These distinctions include a nomination of what to consider primary and secondary. They establish the grammatical format of a mechanical and a formal world view. Such views become imposed on the domains addressed by means of mathematics and formal languages. Through such impositions symbolic power of mathematics becomes exercised. The idea that mathematics describes as it prioritises is discussed with reference to robotting and surveillance. 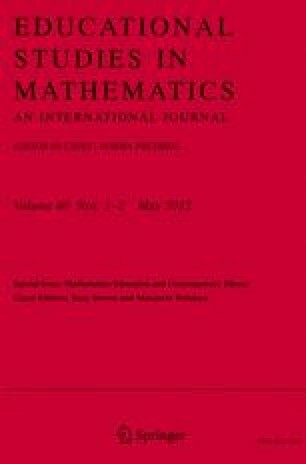 In general, the symbolic power of mathematics and formal languages is summarised through the observations: that mathematics treats parts and properties as autonomous, that it dismembers what it addresses and destroys the organic unity around things, and that it simplifies things and reduces them to a single feature. But, whatever forms the symbolic power may take, it cannot be evaluated along a single good–bad axis. Many of the ideas I have presented here are inspired by cooperation with others, and together with Keiko Yasukawa and Ole Ravn, I have explored many aspects of mathematics in action. I want to thank Laurinda Brown, Peter Gates, Brian Greer, Danny Martin and Miriam Godoy Penteado for many suggestions for improving the paper, and Kristina Brun Madsen for a careful proofreading of the manuscript.